An international team led by Northwestern University is getting closer to understanding the mysteriously bright object that exploded in the northern sky this summer. On June 17, ATLAS twin telescopes in Hawaii discovered a surprisingly bright anomaly in the constellation Hercules at a distance of 200 million light years. Called AT2018cow or “Cow” (cow), the object quickly flashed, and then almost as quickly disappeared. After combining several images from various sources, including hard X-rays and radio waves, a multidisciplinary team of experts suggests that the telescopes recorded the exact moment when the star exploded to turn into a black hole or a neutron star. Star debris, rotating around an object’s event horizon, caused a surprisingly bright glow. This rare event will help astronomers better understand the physics of the first moments of the creation of a black hole or neutron star. 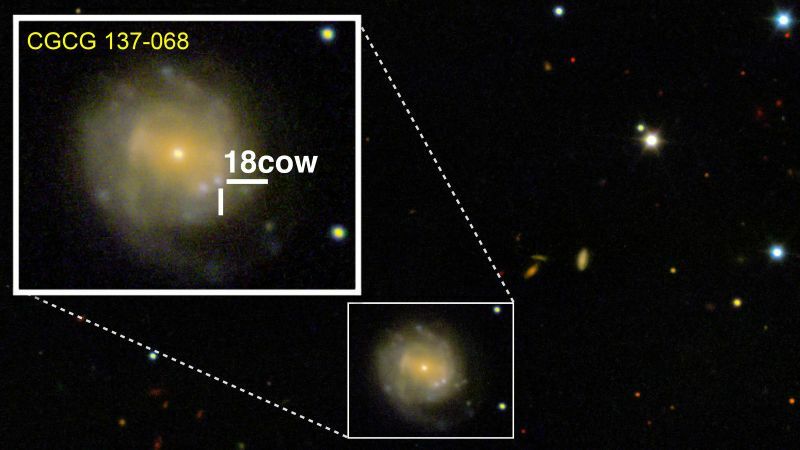 “We think that the Cow is a formation of an accreting black hole or a neutron star,” says Raffaella Margutti from the North-West region, leading the research. “We know from theory that black holes and neutron stars form when a star dies, but we never saw them right after their birth. Never”. After the Cow was first discovered, she immediately became interested in the international community and made astronomers scratch their heads. “We thought it was a supernova,” said Margutti. “But what we observed differs from our current notions of star death.” First, the anomaly was unnaturally bright — 10-100 times brighter than a typical supernova. It also broke out and disappeared much faster than other famous star explosions, with particles flying at a speed of 30,000 kilometers per second. In just 16 days, the facility has already radiated most of its power. In a universe where certain phenomena exist for millions and billions of years, two weeks are equal to an instant. “We immediately realized that this source had moved from inactive to peak luminosity in just a few days,” said Margutti. “It was enough to excite everyone, because it was so unusual and, by astronomical standards, very close.” Using access to the observatory objects of the Keck Observatory in Hawaii and the MMT Observatory in Arizona, as well as remote access to the SoAR telescope in Chile , Margutti examined in more detail the structure of the object. Scientists studied the chemical composition of the Cow, finding clear evidence of the presence of hydrogen and helium, which excluded those models of the fusion of compact objects that produce gravitational waves. After ATLAS discovered the object, the Margutti team quickly obtained follow-up observations of the Cow with NuSTAR, INTEGRAL, XMM-Newton and VLA. Margutti attributes the relative nakedness of the Cow to the disclosure of this intergalactic mystery. Although the stars constantly collapse into black holes, a large amount of material around the newly emerging black holes does not allow astronomers to consider the details. Fortunately, around Cow the material was about 10 times less than with the usual explosion of a star. The lack of material allowed astronomers to look directly into the center of the object.